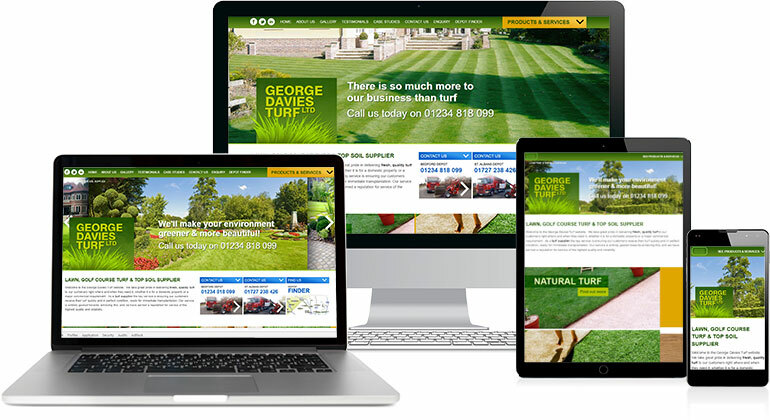 Content managed bespoke and fully responsive website for local turf supplier, whose business has more than quintupled in the last five years with the site and our SEO significant contributors. George Davies Turf came to us for their first 'proper' website in 2010, having been in business for around 10 years and with virtually no online presence. Now in 2016 with their 3rd website with us, Freetimers provides on-going assistance and management for most of their online activities, domain names, hosting and SEO/marketing, with their business quintupling in turnover since we started on their SEO in 2011. Throughout our relationship with the client we have worked hard to help refine and position the brand, uncovering the business' USPs, and ensuring the high quality of the products, their freshness, the responsiveness of delivery and how this can hugely improve the final results for their customers, was reflected with their logo and integral to their website designs. Individual pages were also designed for targeted customer segments to empasize how their specific needs were being understand and delivered. For their latest website we designed a fully-responsive modern website design, which has its own CMS/management system, manageable banners, bulk email and products database, plus a new highly complex batch management, stock, and logistics delivery system. The logistics system can be managed via a large touch-screen, and it allows them to manage purchase orders, incoming stock, sales order taking, stock order allocation, and then deployment of outgoing deliveries from multiple depots, using multiple suplliers, lorries and journeys, and all in a highly time-sensitive process. Online order taking and processing also links to invoice and despatch note production, as well as picking lists and auto-created map production for each journey. A year after coming to Freetimers, in 2011 we started our SEO service, and the results have been nothing short of spectacular. From a baseline of virtually no Google presence, now in 2016 the site achieves nearly 800 top 10 rankings, with 700 in the top 5 and more than 350 No 1 positions. As the website and the business success has grown, George Davies Turf have continued to work to keep their website up to date as well as investing in its management system to automate and streamline their business processes, which will then facilitate even more growth. Since 2010 the website has achieved visitor growth of more than 3,000% (still gowing too), with the business's turnover also increasing by more than 500%.